Sie kennen New York und haben schon alles gesehen? Dabei gibt es in der Stadt auch für alte Hasen jede Menge Neues, Spannendes und Ungewöhnliches zu entdecken. New-York-Kennerin Claudia Hellmann berichtet. You can easily spend your first, second, or even third visit to New York looking at the main sights and attractions. But the city wouldn’t be what it is if it didn’t have so much more to offer, including a quirkyskurril, kuriosquirky side with plenty of surprises and little-known, unexpected places to visit. So follow us off the beaten track and discover a different kind of New York, filled with places you may not have known existed. Let’s start our tour in the south of Manhattan at the old Fraunces Tavern, which dates back to the very early days of New York. The yellow-brick houseBacksteinhausbrick house looks small today, to dwarfklein erscheinen lassendwarfed by the shining high-riseHochhaushigh-rises that surround it. When it was built, in 1719, it must have been a pretty big mansion. Originally the home of the daughter of New York’s first native-born mayor, Stephanus Van Cortlandt, it was bought in 1762 by Samuel Fraunces, who turned it into the Queen’s Head Tavern, named for Queen Charlotte of England. Today, more than 250 years later, it is still a tavern with, as you would expect, plenty of character and — less expected — an upstairs museum. The tavern is rich in Revolutionary history and has kept the look and feel of days gone by, with wooden tables, long benches, and creakingknarrendcreaking floorboardHolzdielefloorboards. It is easy to picture the comings and goings of colonial New Yorkers here all those years ago, when this was a cornerstoneGrundpfeilercornerstone of New York social life. Despite its loyalist-sounding name, the Queen’s Head was used as a meeting place by the Sons of Liberty, a secret society formed to protect the rights of the colonists and fight taxationBesteuerungtaxation by the British government. During the American Revolution, it continued to be an important meeting point. It is most famous as the place where, on December 4, 1783, a week after British troops evacuated the city, George Washington invited his officers to a farewellAbschieds-farewell dinner in the Long Room. In the early days of the United States, Fraunces rented out rooms at his tavern to the new government, so it served as home to some of the very first government offices. All this history is documented in the small museum at the tavern, a great way to combine your visit with an excursion into New York’s past. Many visitors enjoy the walk across Brooklyn Bridge with its panorama of downtown Manhattan. But once they have crossed the East River, most simply get on the subway and go back. This is a shame, since beautiful Brooklyn Bridge Park is just steps away. The waterfrontFlussuferwaterfront park’s wonderful centerpieceHerzstückcenterpiece is Jane’s carouselKarussellCarousel, an almost 100-year-old carousel that was once part of an Ohio theme park and was lovingly restored over a period of 20 years. The 48 wooden horses, each of them different, are now housed in a custom-builtspezialangefertigtcustom-built jewel box, a $9-million acrylic-glass pavilion designed by French star architect Jean Nouvel with skyline views to match. Visit on weekday mornings if you want to enjoy a close-up look at the nostalgic carousel. On weekends, you’ll see the spectacle of children’s birthday parties and members of weddings posing for pictures. Browse the boutiques in the converted warehouses nearby. If it’s American food you are after, mainly an excellent burger, you are to be spoiled for choice (UK)die Qual der Wahl habenspoiled for choice in New York. One of the best burgers in town is to be found in an unusual location, the stylish Parker Meridien hotel. Past the lobby — all shiny marbleMarmormarble, high ceilings, and designer couches — a simple neon hamburger sign at the end of a narrow corridor leads the way to the Burger Joint. Through the heavy velvetSamt-velvet curtains, you enter an unexpected world. You’ll feel like a Prohibition-era New Yorker walking into a speakeasyFlüsterkneipe mit illegalem Alkoholausschankspeakeasy bar. Graffiti-covered walls, beat-up wooden chairs and tables, and hand-painted signs to set the stagehier: die Kulisse bildenset the stage for a down-to-earthbodenständigdown-to-earth burger feastMahl, Gelagefeast. Just step up and order your burger — with or without cheese, cooked medium or rare, and with whatever you like. Try it with “the works”: lettuceKopfsalatlettuce, tomato, onion, pickle (N. Am. )Essiggurkepickles, ketchup, mayo, and mustardSenfmustard. The burgers are juicy and done to perfection, and the casual atmosphere is a little piece of Americana. Get more unusual New York tips in 99 x New York, wie Sie es noch nicht kennen by Claudia Hellmann (Bruckmann Verlag), to be published in spring 2018. 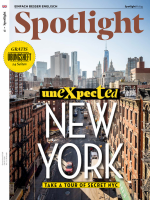 For more quirky tips, including very different kinds of art, an old-fashioned circus sideshowNebenvorstellungsideshow, and an insider’s taste of Brooklyn, take a look at the longer version of this article in the January issue of Spotlight magazine. Dieser Beitrag stammt aus dem Spotlight-Magazin 1/2018. Die gesamte Ausgabe können Sie in unserem Shop kaufen. Natürlich gibt es das Magazin auch bequem und günstig im Abo.